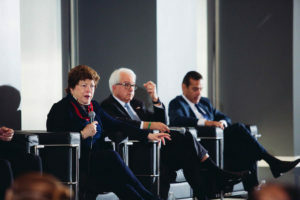 Delaine Eastin, John Cox and Antonio Villaraigosa fielded questions about housing affordability. On January 25th, the new alliance, Minority and Millennials for Housing and Homeownership (M & M’s), hosted the first Gubernatorial Candidates Forum. With the goal to ascertain the candidates’ positions and plans to address the housing crisis, the day proved a great success. Gubernatorial candidates in attendance included Former Mayor of Los Angeles, Antonio Villaraigosa, Assembly Member Travis Allen , Former State Superintendent of Public Instruction Delaine Eastin and Businessman John Cox. Over 200 community leaders and housing advocates attended and many asked poignant questions of the candidates. All the candidates identified the misuse of CEQA and other regulations as major impediments to housing development. Some were actually candid enough to also identify that prevailing wages on housing developments increase the costs for all renters and home buyers.